Adding music into the home or classroom environment is so important to do. Music is a wonderful, powerful tool for little learners. It captures their attention and minds in an important way. Even with young preschoolers, learning how to find the beat in songs is a completely do-able and learnable skill. It’s important they learn to hear the patterns in music, the “heart beat”, and be able to tap along with it. Music is a good introduction to math for young children. The beat of a song is the basic pattern that underlies it. Helping children feel the beat and respond can help them begin to think about patterns and rhythms. Also, moving to the beat helps develop gross motor skills and control over body movements. Music is a great teaching tool! 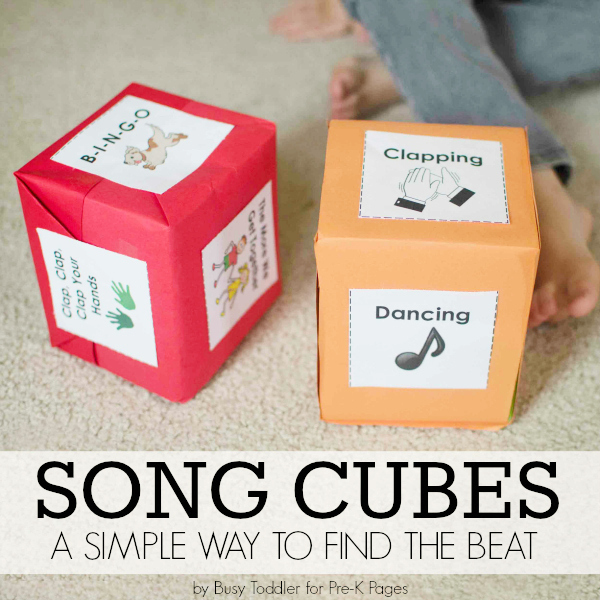 One of my favorite ways to incorporate songs and teach the beat is by making a simple song cube. For this music activity, we made two cubes for double the learning fun. 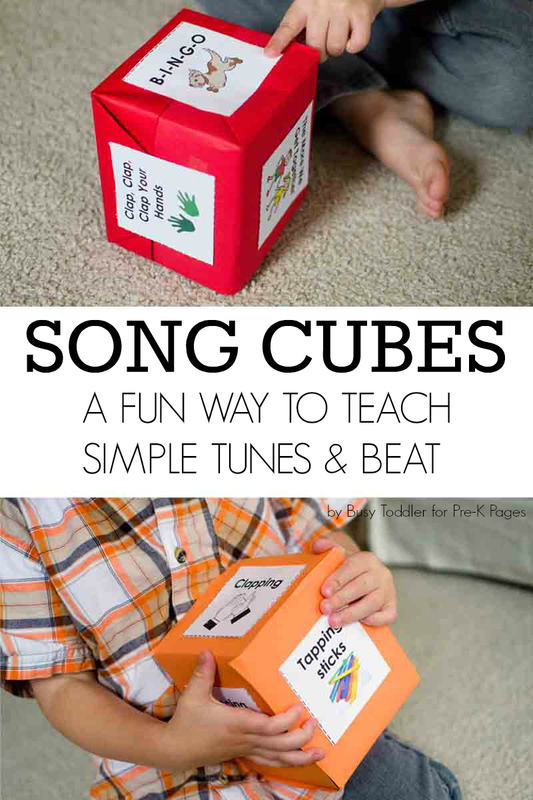 Song cubes are a great tool to have on hand at home or in the classroom. They can be easily customized to fit thematic units, seasons, or various holidays. They make a great addition to the morning routine in a classroom or as a fun “what should we do next?” activity in the home. For the “simple tunes” song cube, I covered the tissue box with construction paper and added a label for each of the possible simple songs. I made sure to fill my song cube with easy-to-learn songs that we can quickly find the heart beat in. The second cube we made is where things take a little turn. 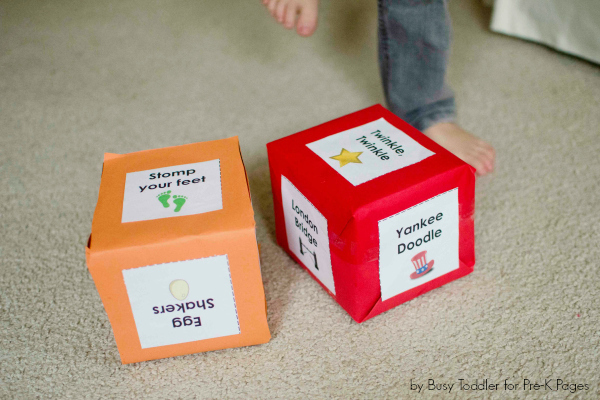 This second cube included different ways to express the beat – either with gross motor skills or homemade instruments. Since this is an at-home activity for my family, my son tossed both cubes to see which song and which movement go together each day. “B-I-N-G-O” plus clapping means we will find the beat with our hands. Maybe the next day it’ll be “Twinkle, Twinkle Little Star” plus tapping on our legs. The 36 possibilities for matches gives an added twist of surprise and anticipation each day. 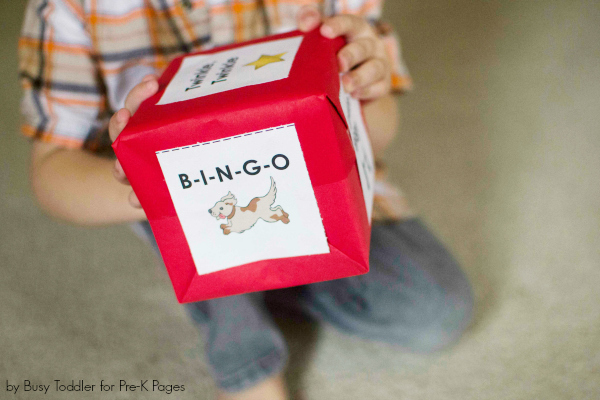 In a classroom setting, inviting class helpers to toss a cube is a great way to share and take turns. Toss the cube. Sing the song and show the beat in way rolled. Sing the song slowly as children are beginning to discover the beat. Adjust the tempo of the song as children master clapping/moving to the beat. To extend this activity, consider speeding up or slowing down the song on a day-by-day basis. A fast version of “London Bridge” is a simple way to demonstrate the variety of beat patterns. Creating a simple song cube for my son has been a huge hit in learning some classic old songs. Pairing the song cube with our “movement cube” has made for a great daily lesson in finding the beat. Follow my Music in the Classroom Pinterest Board for more great ideas!